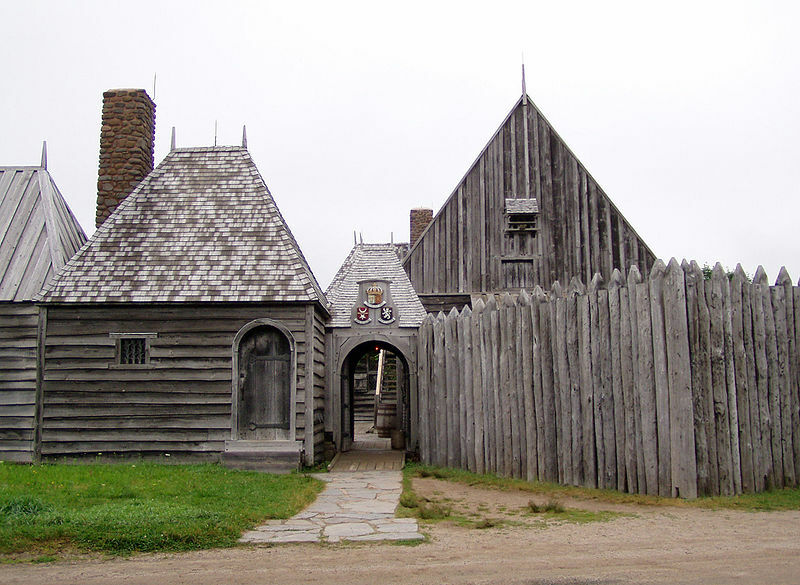 Acadians, as we know, are a French-Canadian people who settled at Port Royal, Nova Scotia, in 1605 (replica above) and intermarried with the Native people, primarily Mi’kmaq. They were expelled from Canada by the British in 1755 and set adrift, winding up literally dispersed to the winds, landing in various places in the US, Europe and in the Caribbean, before they congregated in Louisiana and became known as Cajuns. A group of about 900 of these displaced people, now refugees with nothing to their name, arrived in Maryland, a Catholic colony, and spent several years living there, many trying to make their way back to Canada. With the end of the war in 1763, these Acadians desperately wanted to settle among their own people. Some did return to Canada, but the rest found their way to Louisiana, the last group leaving in 1769. Marie Rundquist, an Acadian descendant and founder of the Amerindian – Ancestry Out of Acadia DNA project, lobbied for 2 years for a sign commemorating this forgotten episode in Acadian and Maryland history. Marie says, “One of my personal goals is to assign dignity to the heritage that I have learned is truly mine. To have a sign like this brings an Acadian history into the mainstream, and recognizes a people whose ancestry has not always been held in the highest esteem, and whose integral role in early American history has been largely dismissed by traditional scholars. On July 28th, 2013, on the day of the Acadian Memorial and Remembrance, when Acadians around the world recall the expulsion of 11,000+ Acadians from Nova Scotia in 1755, Marie celebrated by unveiling the sign in Princess Anne, Maryland. Way to go Marie!!! To read more about Marie’s activities, DNA projects and Acadian research, click here. This entry was posted in Acadians and tagged General Information by Roberta Estes. Bookmark the permalink. Is there a specific mtDNA haplogroup for the Acadians who represent the Native people (primarily Mi’kmaq) who intermarried with the French Canadians? Is that mt haplogroup found in Canada now? In Maryland? In Louisiana? One of the chief findings of the Amerindian Ancestry out of Acadia project has been a strong trend for Native American haplogroups among descendants of original Mi’kmaq grandmothers who made their early, 17th-century homes in Port Royal, Nova Scotia, Canada. The family histories of descendants having Native American haplogroups include, at first (beginning in the 1600s), the parishes in Nova Scotia. Later, following their ancestors’ deportation from Nova Scotia in 1755, locations in Louisiana, Maryland, and elsewhere in the United States and Canada emerge, as families were separated and dispersed. The A / A2 mtDNA subclades, and “matching” DNA results, for example, feature in the results of these descendants who make their homes across the United States and Canada. A similar phenomenon has been noted among male descendants of Germain Doucet of Nova Scotia, Canada, born in 1641, whose descendants (also living in the United States and Canada), share a C P39 Y chromosome (C3b) Native American haplogroup result. Similarly, following the deportation of 1755, the descendants of Germain Doucet were dispersed, and family histories include Nova Scotia, Louisiana, and other locations in the United States and Canada. The A2 mtDNA and the C P39 Y chromosome haplogroups are further researched in focused haplogroup studies. Oh WOW, those were my people and I have a paperwork trail to prove it. That is now on my list of places to visit. They were in the group who eventually moved to Quebec province after petitioning the government to let them return to Canada. What a sad story. Another example of man’s inhumanity to man. Thank you for keeping us apprised of our history.